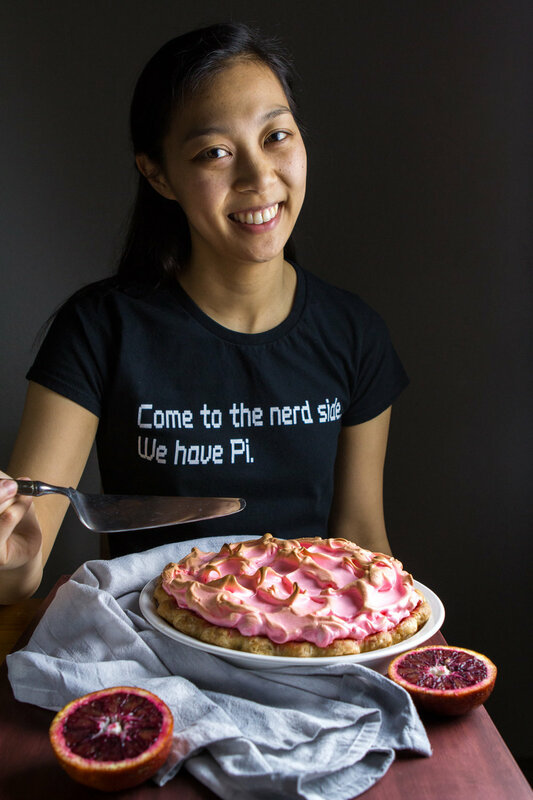 The Pink Pie — knead. bake. cook. As is usual with Lemon Meringue Pie, you start by blind baking the crust. There was nothing new there except for making sure it was baked all the way through. Since I had some blood oranges, I decided to add some of their juice and zest as well. That solved my problem of not having any zest and their color is akin to that of pomegranates. When it came to adding the juice and zest at the very end, I held my breath and hoped for the best. With different lighting, the filling could be brown, pinkish brown, brownish pink, rose taupe etc... As color theory told me in design school, it wasn't likely that the result would yield the same deep magenta as the color of actual pomegranates and blood oranges. At that point I was stuck. The filling was obviously not a bright pink and the next step was to cover it with meringue. Should I make that pink too??? I've never colored meringue for anything except for macarons and those are baked into a crispness that you don't want in a meringue pie. Despite my better judgement, or maybe for the better, I added a bit of red food coloring. The thing about food coloring is that it can come in a gel form. And when you try to fold a gel food coloring into a meringue that you don't want to over whip, it's very, very hard to incorporate it fully. And if you are trying to go for a marble effect, that just doesn't happen. What does happen is you get clumps of red food coloring that look like... well, blood clots. So you end up fishing those out from the meringue and hope that you got all of them out. In addition, colored meringue does still brown in the oven. The addition of color does not prevent that. Meringue pies also tend to weep which is totally and completely normal but combine that with a colored meringue and a super rainy week, they weep even more than usual. So what does it taste like? I used half pomegranate juice and half blood orange juice but the blood orange flavor overpowered whatever pomegranate flavor was in there. Or maybe there isn't much flavor to pomegranates and it is a good thing I didn't do all pomegranates? I personally missed the tartness of lemons or yuzus or limes. Blood oranges tend to be more sweet and are honestly not my favorite citrus. They are pretty! But flavor wise, I want something that is slightly more tart than sweet. Absolutely make this and eat it on the same day. However, do allow at least 2 hours for it to cool completely before cutting. If you are going to dye your meringue, add in the food coloring when soft peaks start to form to make sure it is incorporated thoroughly and before it has a chance to over whip. Or, try this method, but it requires you to pipe your meringue on top of the pie which in my opinion is a lot more work. Make sure the meringue is placed on top of a hot filling. This will prevent the meringue from shrinking (this happened to me the next day). In normal meringue pie baking cases, I would have been able to whip up the meringue before the filling had a chance to cool down. Since I was waffling back and forth between adding color and not adding color, the filling cooled down by the time I had finished the meringue. You can also prep the meringue so it is ready before the filling has finished. As a warning, the longer you let this pie sit, the more the color will leach out of it. This happens with both the filling and the dyed meringue. I had not noticed this happened in a Lemon Meringue Pie because the color of lemon is virtually the same as the crust. But in a pomegranate/blood orange version, that color is very bright red. The same goes with the meringue, if you choose to dye it. As it weeps, it weeps the color of the dye. Unless you don't mind how this looks, see Tip #1. Just embrace it, and have fun or say hell no, and stick with the classic version instead. The recipe uses this Yuzu Meringue Pie recipe as a base. Instead of using ¼ cup yuzu or lemon juice, use 2 tablespoons pomegranate juice and 2 tablespoons blood orange juice or ¼ cup blood orange juice. 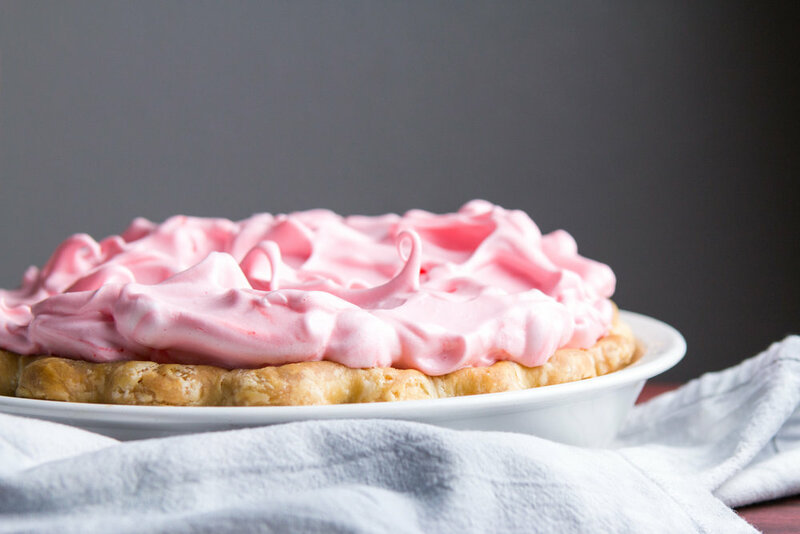 If choosing to dye your meringue, add a few drops at a time, and add when soft peaks start to form so you have enough time to incorporate it before it becomes over whipped. I did happen to get some new self-portraits I have been meaning to get to out of this pie, though!